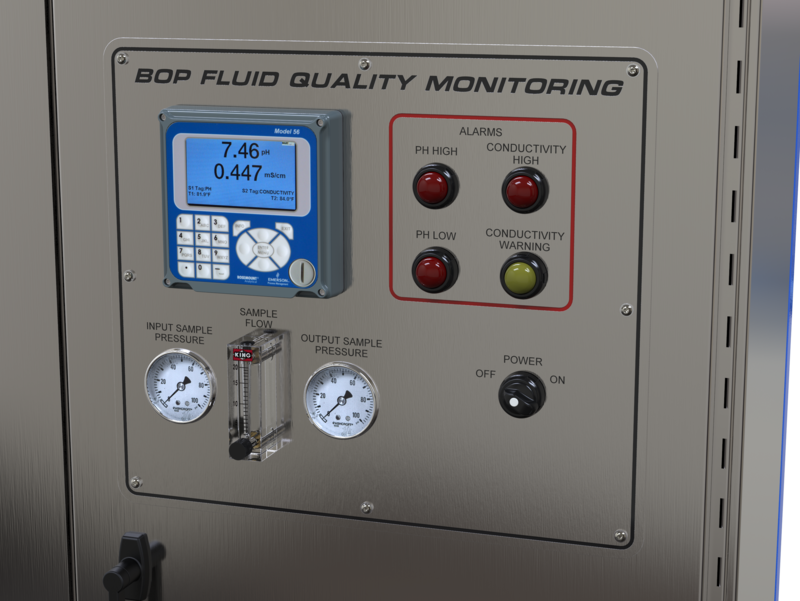 BOP Fluid Conditioning & Monitoring System is primarily designed to improve fluid quality by reducing microbial activity, removing suspended particles and provide real-time data of BOP fluid pH and conductivity for event & trending analysis. The two main causes for BOP fluid quality problems include contaminated water supply and microbial growth in the mixed fluid. Downtime and failure reports indicate several re-occurring problems with these fluids and in order for the subsea and BOP hydraulic components to operate reliably, the mixed fluid must stay clean and provide a minimum level of lubricity. Offshore Blow Out Preventer (BOP) fluids are critical to the reliability and functioning of the BOP control system. These water based fluids and make-up water supply are normally tested by taking daily or weekly samples that are sent to a lab onshore. This periodic testing may completely miss or at best delay the corrective action of an event of poor quality fluid that has made its way to the BOP equipment. 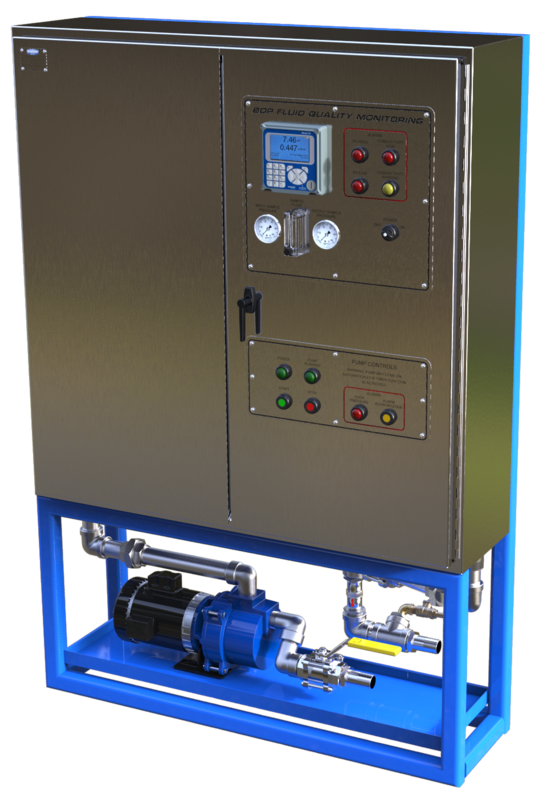 Aside from the improved fluid quality the continuous conditioning provides, The Subsea Co. monitoring equipment will capture anomalies in pH signaling changes in microbial growth and conductivity indications of dissolved solids. Analysis of this data and correlating it with known events and activity surrounding BOP fluid make-up, storage and use will assist the subsea engineer to eliminate the occasional incidents that cause poor BOP fluid quality thus reducing downtime and saving money. 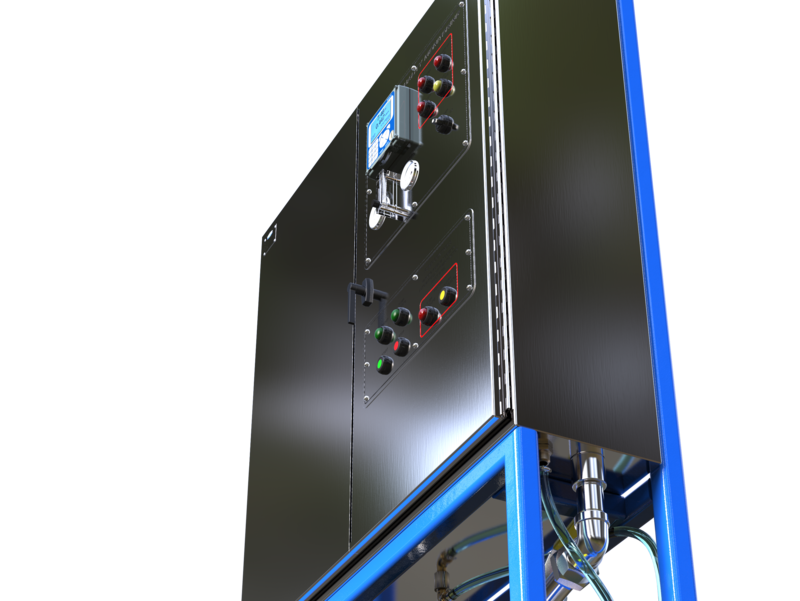 To learn how our BOP Fluid Conditioning and Filtration system can improve your BOP fluid quality, contact a Subsea Company representative today to arrange a demonstration.